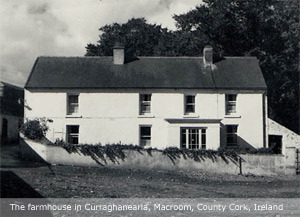 Welcome to the Roche Family Tree website - an online account of the Roche Family of Curraghanearla, Macroom, County Cork, Ireland, and descendants. Six generations of Roches are represented dating from the early 1800s to the present day. The idea for this website came from Michael Roche and surfaced around the time of the Roche Gathering on the 25th July 1999 - that wonderful sunny day when so many of us met at the Roche homeplace in Curraghanearla and afterwards at Blarney Park Hotel. Photographs and accounts of that day can be found on this website. While the website shows a good deal of information about the family it is hoped that more and more information will be unearthed, omissions corrected and that the website will be updated on a regular basis. We would be especially grateful to be informed of new births and deaths. We would encourage you to make new contacts with Roche descendants so that both the family tree and the list of contacts on this website can grow. We welcome all Roche descendants and their many friends to participate in this study. A special invitation to participate is extended to Roche descendants in the far-off shores of England, Australia, America and other countries. It is one of the aims of the website to help maintain regular contact with our extended family around the world. If you have information, memories, anecdotes, articles or photographs (with captions) please do not hesitate to share them with us. You may send them to any of the names listed below. Furthermore, if you notice any factual mistakes in the website please let us know. Suggestions for improvement of the website are welcome.